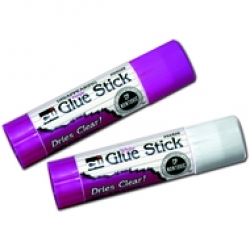 "AP Certified, non-toxic" purple glue sticks. Providing neat and clean applications, they are ideal for paper, cardboard, photos and fabric. Washable, ordorless, dries fast and clear. Convenient lipstick style applicator. Acid free, conforms to ASTM D-4236. Sold by the stick, doz or in our convenient class pack of 30.